The decision by Justice Thomas Au Hing-cheung on July 14 to expel four legislators from the Legislative Council (Legco), including veteran democracy campaigner, ‘Long Hair’ Leung Kwok-hung, is a massive blow against the democracy struggle in Hong Kong and, by extension, also in China. This was nothing short of a coup by the right-wing authoritarian pro-Beijing establishment. What does the coup mean? It is the most serious attack on democratic rights since the handover in 1997 – it cancels out 180,000 votes of ordinary electors and rewrites the election results from September in favour of the government. It gives the pro-Beijing camp a free hand (so-called ‘supermajority’) to change the rules of Legco – already a rigged undemocratic pseudo-parliament – to permanently weaken the possibilities of the opposition to delay or resist the government’s pro-billionaire and anti-democratic policies. It represents a new level of blatant manipulation of Hong Kong’s ‘independent’ judiciary, which now acts in political cases just like a carbon copy of the regime-controlled court system in China. In 2017, so-called ‘rule of law’ is a screen to hide a highly politicised agenda to strangle democratic rights. Most seriously, the disqualification ruling sets a new threshold as to how far the forces of authoritarian rule are prepared to go in Hong Kong – their ‘appetite’ for more repression and undemocratic attacks will grow. This is already happening! The establishment have been enormously emboldened and are openly celebrating the coup. It is therefore a life and death matter for the democracy struggle that the attack on the legislators is met by a powerful organised protest campaign to demand their reinstatement and the tearing up of all the recently imposed undemocratic restrictions – on the right to stand in elections, oath-taking, and the other devious legal inventions of China’s undemocratic NPC and puppet Hong Kong government. We say, the legislators represent the “red line” of the democracy movement and we will not allow the government in Beijing or Hong Kong to cross it! This was a 100 percent political trial and the spurious grounds on which this ruling is based – on the ‘sincerity’ of parliamentary oaths – is lifted straight from the pages of Kafka. It makes a mockery of Hong Kong’s ‘rule of law’ which has become ‘Xi Jinping law’. It is not the legislators who should be on trial but the undemocratic and corrupt government. The real reason for this attack is political not procedural –the Chinese dictatorship wants to increase its control over Hong Kong and strangle the democracy struggle. It fears that the democracy virus can spread from Hong Kong to China. It therefore wants to erode or abolish long-established democratic rights and concessions that were won through previous struggles. It wants to decide not only who can be Chief Executive, but also who can sit in the Legco and, by extension, who can speak for the democracy movement. 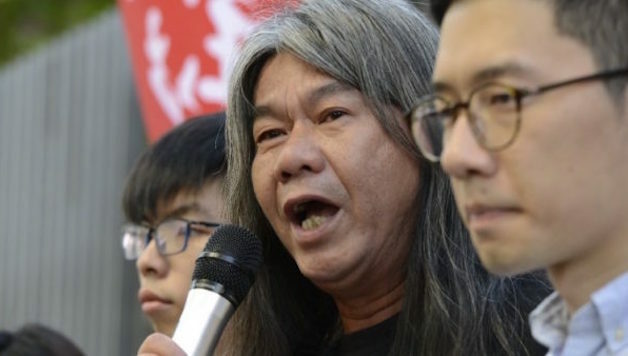 In particular, the attack on ‘Long Hair’ Leung Kwok-hung, by far the most well-known of the expelled legislators, and the only standard bearer of the left in the Legco, is a very calculated move by the establishment. Beijing wants to show that there are “acceptable” and “unacceptable” democrats, which it decides of course! Its strategy is to split the pan-democrats into a harmless ‘reconciliation’ wing, who must demonstrate their ‘sincerity and solemnity’ by distancing themselves from mass struggle, and the ‘irreconcilables’ which Beijing is at this stage concentrating its repression against. But if the more radical lawmakers are defeated, then inevitably the white terror will be expanded against other sections the democracy movement. That is always the logic of repression – to believe otherwise is to ignore history. ‘Long Hair’ is the main target of the purge with others included to support the illusion of a legal premise (the so-called improper oaths) rather than what it is: a politically motivated attack. Widening the purge to six victims gave the establishment the chance to further rig Legco procedures in their favour. It also makes it much more difficult for the opposition to fully reverse this attack in the byelections, which can be further delayed and held under extremely undemocratic conditions – by banning some or all of the disqualified legislators, and by holding the byelections simultaneously to increase the pro-government camp’s chances. This anti-democratic agenda must be resisted by mass action. The democracy struggle cannot afford to show hesitancy, fear, or to fall into the trap of believing in compromise, or that a ‘reasonable’ wing of the establishment exists that could come to the rescue. The time for fairy tales is past! We, Socialist Action, support fighting through the courts including to the final stage of appeal, and we support a strategy to fight the byelections – whenever they are allowed – but that is not enough. The courts are rigged and the final outcome is unlikely to be good. The campaign in the courts should be a platform for mobilising mass protests, not an end in itself. The byelections and their timing, while important, should not become the sole focus because this would cost precious time. The fight back needs to start at once. The biggest question: How do we fight back? Millions of Hong Kongers are angry but also extremely worried – and looking for a way to oppose this vicious attack. These masses are the only force that can stop the attack, but their power needs to be organised, to be mobilised, and to be offered a viable strategy for defeating the government and defending democratic rights. The seriousness of this situation requires the biggest possible mobilisation of resistance, not just one-off demonstrations but a wider strategy to develop and escalate mass civil disobedience. This requires a new approach to transform the democratic struggle away from control by a small circle of pan-democratic leaders and their allied NGOs, towards mass democratically-run grassroots organisation in every local area, school and workplace. The old model of top-down pan-democratic-led limited one-off protests has shown it cannot achieve democracy or defend existing rights from the regime’s attacks. Even the mass Umbrella Movement ended without shifting the government. The Umbrella movement had to overcome the hesitancy and backsliding role of the moderate pan-democrats and their allies like ‘OC’. The big lesson from 2014 is that we need democratic control from below. Also, and just as crucial, we need a clear fighting democratic programme which states that the Chinese dictatorship is the problem, and there will be no democracy in Hong Kong or China as long as it exists. It is not enough, as many of the Umbrella forces believed, to avoid this question or cover it with vague calls for ‘reform’. At recent democracy protests the level of frustration has risen and become very obvious. Many activists and youth (who can influence and bring the masses into the struggle) demand more than speeches, more than a condemnation of the establishment’s attacks, and more than a new demonstration which is only to let off some steam (demonstrations are important but we know they are not enough by themselves to change the situation). What is a viable strategy for resistance? People want to know, “What is the proposal? What is the next step and the plan to fight back?” We, Socialist Action, propose as part of an urgent discussion within the democracy struggle, the following proposals as an outline of how such a campaign can be organised in defence of the legislators: Make 928 a day of mass resistance, with school walkouts, strikes and other forms of civil disobedience. September 28th is the 3rd anniversary of the Umbrella Revolution. We urge the four disqualified radical legislators to make a public appeal to set this as the date of a mass coming out. The democracy struggle in Hong Kong has faltered and one of the reasons is because the main weapon of democratic struggles globally – strike action – has never been seriously used or featured as part of the struggle in Hong Kong. Occupy is a useful protest method, up to a point, but like one-off demonstrations it also has limitations (it is hard to sustain for long periods; unlike a strike it does not hit at the economy or the control of the ruling elite). Strikes – even starting among students – represent a much more powerful weapon against the system. They need to be organised, active (not staying at home), and serve to pull students, workers, employees together as a disciplined and powerful force. With the resurrection by Carrie Lam of the school brainwashing plan, there is a need for students and school students to organise and this struggle is of course closely linked to the Legco coup. With serious preparations, rallies, a campaign in every college and school, and calling for students grassroots strike committees to be set up, 928 could be turned into a massive protest day of a new type – showing the democracy struggle has learned and been forced to learn a new and powerful tactic – the political strike! This can start with the students but spread to other groups. The government would be put on notice: withdraw your attacks or we escalate to the next level! How is a student strike possible with localists controlling the student unions? We believe this is not an insurmountable problem. The localist student officials can be put under massive pressure if they try to stand against mass protests – their position is already more and more questioned. The idea of a strike can capture the imagination of the youth who will not be blocked or bothered by the formal structures of the student unions, and can bypass these structures if the officials try to block them. It is necessary to appeal directly to the students and school students and urge them to build their own committees to begin organising. Link together the struggles. It is necessary to link the disqualification attack with the other imminent attacks such as school brainwashing and Article 23. These are all elements in a coordinated plan by the dictatorship. An effective resistance must recognise this and unify its political counter-attack. Of critical importance is to link opposition to the Legco coup with the the struggle against the government’s neo-liberal pro-billionaire agenda of refusing a universal pension, refusing basic workers’ rights like the 8-hour day and a decent minimum wage, and promoting white elephants at the expense of improved public services. There is a need to turn outwards and campaign, mobilising all those who want to be part of the struggle, with hundreds of thousands of leaflets at MTR stations, workplaces and schools, explaining that the government’s plan to turn the Legco into a mini-NPC is a step to other, bigger attacks. Call a ‘war conference’ of activists. Such a meeting is needed – not to discuss general ideas about democracy in Hong Kong but to focus on the specifics: How to organise a unified fight back? Its role would be to hammer out a campaign plan, including discussion on how to launch a mass protest and walkout on 928 for example. A one-day conference should be convened, inviting all groups, unions, parties and individuals who want to engage in a mass campaign of resistance. This could show the movement is serious, but more importantly that the struggle needs democratic grassroots channels not just a few politicians and activists deciding everything. Who should call this? The four radical legislators including ‘Long Hair’ have a potentially high degree of authority as the front-line victims of this attack. They also have a historic responsibility. They could issue the call for a mass protest day on 928, and they could stand for an invitation to a one-day ‘war conference’ to discuss the main outline of the fight back. The need for ‘unity’ in the pan-democratic camp should not become an excuse for paralysis and blocking the fight back beginning now. If the four lead the way, this will get a response. Other more conservative sections can follow later, pushed into action by events. With a bold approach, this moment could develop into the beginning of a re-launch of the democracy struggle. In our opinion, it is crucial that the two localist legislators (Yau and Leung) are not included in such a campaign – their confused and racist ideas and record will weaken not strengthen the possibilities to develop a real fight back. Yes, we can defend their rights, against the undemocratic disqualifications, but not give them a platform for their anti-working class and xenophobic political ideas. They can follow, but should march separately!